It isn’t difficult to see why Hobbs drivers are so enthusiastic about the new 2019 RAM 1500 redesign and everything it’s bringing to town. While the 2019 RAM will still feature the 3.6L engine as standard and offer the 5.7L v8 engine as an upgrade, there are additions on the horizon too. Drivers will also have access to a more efficient option thanks to the automaker’s adoption of Fiat Chrysler’s eTorque set up which uses a motor/generator in place of the alternator to charge a 48-volt lithium-ion battery pack. This optional system, combined with efficiency upgrades like start/stop and regenerative braking, can improve efficiency while also providing an additional torque boost to equipped models, making the daily drive to Lubbock more fun and more affordable. It even allows the 2019 Ram 1500 to produce more torque than the Nissan Frontier. The RAM is getting a facelift as well with some stylish improvements that include a new RAM grille treatment with available active grille shutters that help to improve airflow and increase efficiency and horsepower. The off-road package will offer a higher suspension lift as well, which will help with ground clearance while delivering a more rugged look for outdoor enthusiasts to enjoy. New interior touches are bound to please Seminole shoppers as well, with the addition of thick front bucket seat bolsters, an available 12.0-inch color touchscreen infotainment upgrade, increased passenger space on the redesigned Crew Cab models, optional heated and cooled front seats, and optional panoramic sunroof. Test Drive the 2018 RAM 1500 Today! You don’t have to wait until next year to get your hands on a luxurious powerhouse like the RAM 1500. 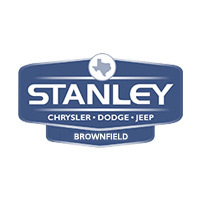 Drop by Stanley CDJR in Brownfield to get a look at the 2018 models already on our lot and ready to drive home today! 0 comment(s) so far on What’s New on the 2019 RAM 1500?